There are at least 12 different parables or sayings in this section. The theme is how we should set our goals and live our lives in view of the uncertainty of this life and the promise of the life to come. We read 12: 13 - 21. Question 1: Why exactly was the rich man such a fool? (You should get at least 4 different ways in which he was stupid.) Here is the story again. The 4 things I can see in this passage are: He assumed he would still be alive to enjoy the produce from his crops. He ignored the concerns of other people. He assumed that "eat, drink ... " would lead to joyful merriment. He ignored the claims of God on his life. Question 2: Isn't having big enough barns for your crops common sense? Isn't it what this world runs on? Yes! It is what this world runs on. It is all a question of motives - good or bad. The teaching of the parable is summarized in the final phrase: he worked for himself and was not rich towards God. It is not easy to be consistently rich towards God but that must be our life-long ambition. Next we read 12: 22 - 34. These verses are all about worry. A great deal of Western culture is driven by worry; if yours is not Western I have to leave it to you to work out how closely this conforms to your situation. We, in the West, are trained from an early age to think we must have the right toys, the right clothes, the right boy's toys, cars, etc. and to worry if we do not! We cannot completely opt out of our world. In the words of Jesus we need to be 'in the world' but not 'of the world' (Jn 17: 11, 14). Question 3: Some of the Lord's servants rely on 12: 31 but if we all did that who would be the givers through whom the Lord would supply us? How then should we understand this? We need to balance this saying with what Paul said to the Thessalonian Christians in 2 Thess 3: 10 - 'if a man will not work he shall not eat'. Somewhere between the two sayings is the right course for each one of us. We read 12: 35 - 48. This section includes no less than 4 different sayings about masters returning home or thieves breaking in. 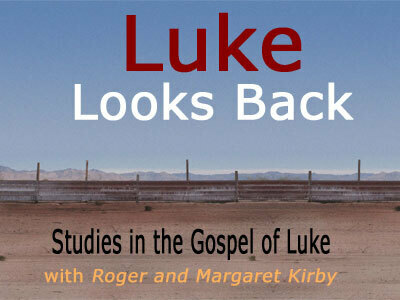 Most likely Luke has brought together things that Jesus said at different times simply linked by key words or ideas. The first homecoming is in v 35 - 38. The old Syriac and Arabic translations (culturally closer to those days) have the servants expecting the master who withdraws from the banquet (both equally possible translations) thus suggesting a pre-arranged plan for the master to bring food home from the banquet for his servants whom he then serves. Question 4: Assuming that is correct, what does this parable teach about the final great banquet (Is 25: 6; Lk 13: 29, 14: 15)? This is an astonishing picture of Jesus receiving us, his servants, and serving us the good things of the great feast. Question 5: In the third and fourth episodes of masters returning (12: 42 - 46 and 47, 48) the emphasis is quite different. What is it? These two parables, or sayings, with their emphasis on senior servants abusing their position over lesser servants, were probably chosen for inclusion by Luke to make some pointed comments to the church leaders of his day, some 40 years after Jesus said these things. They may well be strong rebukes to some church leaders in our day. Question 6: How do you understand the brutal bits (12: 42b, 46b, 47b) in these 2 episodes? Compare 1 Cor 3: 12 - 15. Is it better to shun responsibility in the work of the Kingdom and make sure we are not entrusted with too much? Why, or why not? These sayings are a warning to all those who work in the church: from preaching, to Sunday School teaching and looking after the crèche, to work hard at our tasks, not to take them lightly and not to forget that we need the presence and the power of the Holy Spirit in all that we do for the Lord. Paul said: Do not think of yourself more highly than you ought, but rather think of yourself with sober judgment, in accordance with the measure of faith God has given you. if we do that we shall not go far wrong. Read 12: 39 - 45. The sort of family division mentioned in 12: 49 - 53 is rather alarming. We must never be responsible for the destruction of the peace, except for the fact that we follow Jesus. We must do all we can, apart from denying him, to avoid division. We read 13: 1 - 5. One writer commenting on these verses says: Jesus' question and answer react to the popular notion that sin is the cause of calamity. If God is responsible for everything and God is a just God, the calamities must be the result of human sinfulness. The fallacy in that argument is the notion that God is the immediate cause of all events, which leaves no room for human freedom or freedom in the created order, and therefore for events that God does not control ...'. Question 7: Do you agree with that statement? This is a very doubtful argument, theologically. It leaves God as less than sovereign. The problem that led to the question to Jesus is basically the same as that faced by Job and, in the book bearing his name, the only answer given is that God is an unchanging rock for those who love him in spite of all apparent evidence to the contrary. Perhaps the phrase 'the ordinary chaos of life', accepting that God is sovereign but we can have no idea what he has determined, no window into his sovereignty, is a good and acceptable summary of these verses. Finally we read 13: 6 - 8. This little parable of the fig tree is based on Is 5: 1 - 7.